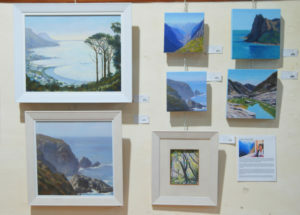 I am a member of the Constantiaberg Art Society and their summer exhibition was held this month at Kirstenbosch Botanical Gardens. There were a record number of members exhibiting. I decided to put up a display of landscapes, and here is a photo of my “panel”. 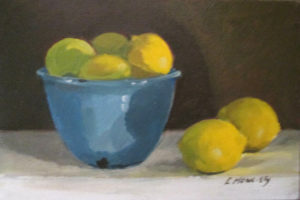 Here are some photos of still life paintings I have done this year and last. 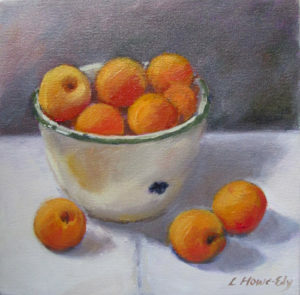 The most recent was a small 25 x 25cm oil painting of apricots in an enamel bowl, below. The bowl was given to me years ago by my the mother of my art school friend, also Linda. 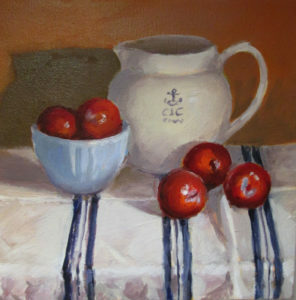 Below is another still life I painted this year. 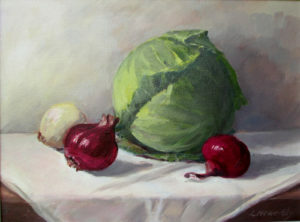 I really find some vegetables very attractive and just have to paint them! 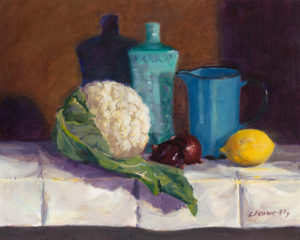 I painted this still life with a cauliflower in 2016. Every week fruit and vegetable sellers come to our house and one day they had some quinces for sale. I had to buy them to paint, and arranged them in front of our cookie jar, on an Iranian cloth. I was delighted when the owner of an interior design shop in the UK bought this work. 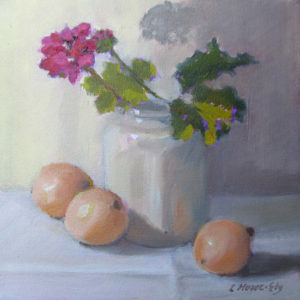 Another small still life I did this year was this one, below, of guavas in front of a jar with a pink geranium in it. It was bought by a lady who moved from South Africa to the UK, and misses guavas! 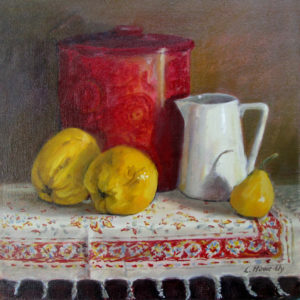 The still life below features a jug I inherited from my grandmother. It has the letters CTC on it; this was a brand of coffee called Cape to Cairo, I was told. I put some deep red plums in front of it. I painted the one below in 2016. The bowl was my mother’s. It also went to the UK.